George Bloss Jr. settled in Atwater in 1844, at the age of 10 with his parents and sister, they were originally from the Connecticut area. George Bloss Jr., was the nephew of John Mitchell one of the original settlers of the San Joaquin Valley. George later went on to marry Christine and become gracious benefactors to many Atwater Projects. In 1922 when the city of Atwater incorporated George became the first mayor of the city. George and Christine had one Child, George Thompson Bloss, who passed away at the age of seven from complications that set in as a result of the measles. George S. Bloss, Sr. passed away in April 1930. His will instructed that two acres and $50,000 be given to the City of Atwater for the establishment of a hospital which was to be known as the Ella Stone Bloss Memorial Hospital (named for his first wife and niece of early California Pioneer John Mitchell). Construction of the hospital began October 1935 at a cost of $90,000. In December 1936, the hospital opened as a Children’s Turbercular Preventative Hospital as well as a hospital for adult patients. Management of this facility was under the direction of Merced County General Hospital and Theresa Voos (1936-38). She was appointed the first superintendent or Head Nurse for the hospital. A school room was constructed on the campus, which was called the Sunshine School and operated at the Bloss Hospital from 1937 to 1942. Mrs. Sybil Crookham helped to set up the school, which originally taught 30 to 35 handicapped and underprivileged children who were patients at the Bloss Hospital. The school was closed in 1942 because treatment for tuberculosis had significantly changed and there were less children in the hospital. In 1946 the school re-opened for children to be taught once again. This time the school remained open until 1957. Between 1948 and 1957, seventy-six polio patients were treated at the Bloss Hospital. After the patient load declined, the hospital was converted, once again and it was at this time that the elderly were moved from Merced General Hospital to Bloss Hospital. In 1948, George Jr and Christine Bloss provided a second grant to build seven private rooms and a sun porch onto the hospital. In 1957, the Bloss family with the assistance of a local attorney, Joseph Lebeda, saw fit to start a movement to turn the hospital into a District Hospital for the people of Atwater-Winton and the surrounding areas. On March 11, 1958 the voters showed their support of such a move. At this time George and Christine Bloss, with the help of Mr. Lebeda picked five people to serve as Board of Directors. The ownership of the hospital then changed from the City of Atwater to the Bloss Memorial Hospital District. The first directors selected and officially appointed by the Board of Supervisors. Those individuals were Satoru George Miyake, President; Louis Passadori, Vice President; Elmer L. Barron, Secretary; G.E. (Ed) Willhoite and Frank Sparks. The District area covers 42.5 square miles in the north portion of Merced County, which included the City of Atwater and the unincorporated community of Winton. The Board of Directors are elected to four year terms in alternate slates of three and two every two years. In 1960, the Bloss family provided $10,000 toward a building fund then later another $50,000 to the district to complete the necessary remodeling. In 1962, Christine Bloss said the hospital needed an office in which she paid for including the furniture. It has been estimated that the Bloss Family had donated in excess of $300,000 prior to the death of Christine Bloss. In 1971, Christine Bloss passed away, which created the “George S. Bloss and Christine T. Bloss Trust”. The trust left specific instruction that the net income earned from the trust would be distributed annually. One half would go to Bloss Memorial Healthcare District and the other one half to three School Districts for Student Scholarships. 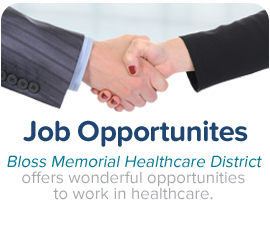 In 1995, Bloss Memorial Hospital District changed its name to Bloss Memorial Healthcare District. In 1996, as a result of a Public Benefit Transfer, Castle Air Force Base Hospital was transferred to Bloss Memorial Healthcare District. In 1998, Bloss Memorial Healthcare District closed the hospital and moved to the former Castle Air Force Base and opened the following services, an urgent care, medical clinics, laboratory, radiology and formed a Partnership with Larry Church, DDS to open Central California Dental Surgicenter, an ambulatory dental surgery center. In 2004, Bloss Memorial Healthcare District filed a d/b/a Castle Family Health Centers to more accurately describe the services of the District. In 2009, Bloss Memorial Healthcare District via an Affiliation Agreement transferred Castle Family Health Centers and its operations and control of the clinics to Castle Family Health Centers, Inc, a 501 (c) (3) Federally Qualified Health Center Look-A-Like organization. And became a landlord to Castle Family Health Centers and other medical and dental tenants. In 2009, Bloss Memorial Healthcare District partnered with US Dental Surgery Center, Inc in Stockton, for the operation of Children’s Dental Surgery Center. In 2014, Bloss Memorial Healthcare District purchased the Central California Dental Surgicenter Partnership they had with Larry Church, DDS and renamed the facility Central California Dental Surgery Center. Bloss continues to partner with Castle Family Health Centers, Inc. to provide care to the community of Atwater. As Bloss continues to define its mission, it is the expectations that Bloss will be able to bring more resources to all of the residents of Atwater and Winton County.